Image consultant Yatan Ahluwalia and make up specialist Jojo groom the urban business traveller . A face masque once a week will tighten the skin, clean hidden dirt and grime, and lift the face, making it look fresher, and younger. To exfoliate dead skin and to polish and brighten it, use an face scrub at least twice a week. Those with dry skin must use a waterbased moisturiser, ideally before they sleep, and those with an oily skin should clean the face with astringent four times a week. The sunblock recommended for Indian men is one that's SPF 30+. Apply the sunscreen before you report to work and reapply after about four hours. Keeping it short is keeping it simple. Short hair isn't just easy to maintain, but also a breeze to style. A short buzz is the easiest 'wash and wear' look. A sporty look works for younger men and a more classic combed look works on salt and pepper hair. Before you head out, it's important to oil, condition, cut, trim and colour your hair. Your hair should be styled with a good strong and long lasting styling product. While travelling, keep the climate and humidity levels of the place you are going to in mind. Choose your styling product accordingly. 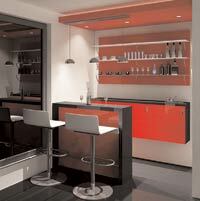 A water-based gel can be used for warm places and a cream should be used for cooler places. In soaring temperatures, a hair-spray will do the trick. An effective deodorant roll-on or spray are a must on an everyday basis. This should be followed up by a dab of fresh fragrance. Choose citrusy, musky or denim tones, depending on your taste. Ensure you wipe and dry your feet twice a day. In case you suffer from B.O, you can sprinkle some talcum before you slip into a pair of cotton socks. 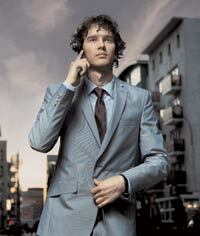 On an off-site, you can afford to carry a mix of semi-formal and casual clothes. Most people tend to overlook the basic practicality of travelling, which entails packing according to the weather. For colder places, throw in lightweight yet warm jackets, thin sweaters, full sleeve round and V-neck T-Shirts. For a tropical destination, bring out the golf shirts and multi-pocket trousers. If you must, wear a minimal ring, without a rock of course. Invest in a chunky watch, chronographs are designed to the frequent flyers. Besides this, neutral belts and ties that match your wardrobe are the way to be. The writer duo has recently set up Y&E Media Pvt. Ltd - A corporate grooming and image consultancy. Japanese masterchef Tetsu Akahira, at Sakura, The Metropolitan, New Delhi explains the health benefits of bento meals. Fresh Fare Without additives and preservatives, the bento box comprises a fresh meal. 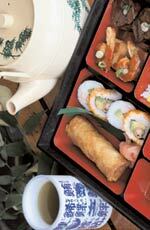 Balanced Diet Traditionally, bentos consist of rice, fish or meat, pickled, raw or cooked vegetables. Just add a fruit or a healthy dessert like the green tea, wasabi, and kidney bean ice-cream, and you'll have yourself the 'complete meal' popularly advised by nutritionists. Calorie Counter To make sure your intake is rationed, the boxes are packed with several compartments that obviously can't be over-filled. This makes it adhere to the popularly prescribed eating style for weight loss, which is small healthy meals. The weight loss principle that bento box operates on, is a clear cut one: one cubic ml equals one calorie. If your goal is a 1,800-calorie-diet, get a bento box of 600ml, which you can use for all three meals, daily. Since the platter exposes you to an array of flavours, your appetite doesn't compel you to binge soon after. Tea House Like all things Japanese, there's always room for a hot cuppa. Pairing with freshly brewed jasmine, basil, camomile and ginger tea will enhance and seal the nutritional benefits of the boxed meal. Dip your feet in a whirlpool of mineral pedi-salts and antiseptic lotion . This will purge impurities, which are the prime cause of tiredness and soreness. Then, give them a dab of moisture by soaking them in a blend of saffron, sandalwood oil and almond oil. Apart from the flavour of course, you love chocolates for their fragrance, colour and texture. These very qualities also make it a therapeutic drug. Soak and scrub your feet with chocolate for a dose of fatty acids, anti-oxidents and minerals. This will replenish dead skin cells and leave you rejuvenated. The last queen of France, her marriage to Louis XVI was fixed to cement ties with Austria. Her famous line to the hungry, 'Let them eat cake', reverberates in class politics till today. Her smile was considered crooked by the French aristocracy, and she underwent painful oral surgery that was spread over three months before her wedding. Her close associations with women triggered rumours of lesbianism. She wasn't crowned alongside her husband on his coronation ceremony, and his anti-Austrian ministers were wary of her participation in French policy. In the book What Marie Antoinette Wore to the Revolution, Caroline Weber notes how the queen started dressing extravagantly and spending ostentatiously to appear powerful. This was the prime reason for public outrage and the outbreak of the French revolution. Sheena Khan, founder of Chizzle, a bespoke interior and design solutions company, helps you call the shots at home. Choose a location where the bar catches the eye, instantly. A game room or basement is ideal. In case you wish to plant it in a living room or study, delegate a minimum space of four feet. If it's somewhere in the centre of the room, furnish it with a log wood flooring and mood lighting lamps. Themes will give it a character. Try fitting it with neon lights and sports memorabilia to make it a sports bar or just throw in some hubcaps and steering wheels for an automotive feel. For an American country feel, furnish it with wooden dartboards, saddle stools and suspend cowboy hats. You could even go vintage with rustic stools, antlers and a workinggramaphone on the counter. This type of setting will go well for your slow single malt evenings. You need to chart out whether to fix a keg box, a mini fridge, install a sink or just a water hose. If resources are limited, consider putting together a liquor cabinet and a counter top, which is set in glass or stone lit from underneath. Supplement it with draft taps, wine coolers and ice makers. What good is a bar if you can't mix your drinks right. A well stocked bar is about more than just bottles in the cabinet and involves sprawling the counter top with impressive tools. These should include shakers, measuring devices, a muddler, a corkscrew, a cutting board, a citrus juicer and an electric blender. Also stock up on two sets of crystal goblets, shot and scotch glasses each. Gaurav Sachdeva, Food and Beverage Manager at Spice Water Trail, New Delhi, mixes cocktails with spices and condiments from India's coastline. Soak Kodumpulli (malabar tamarind) in 60 ml water to create a syrup. Put two slitted green chillies, vodka (60ml), lemon juice(5ml) and sugar syrup(30ml) in a shaker. Garnish with lemon and chilly. Muddle mint leaves in a boston shaker and add kokam syrup(60ml), sugar syrup(30ml), lemon juice(5ml), mint juice(5ml) and vodka (60ml). Garnish with a lemon slice and a mint sprig. After muddling ginger(20gm) in a boston shaker, add tamarind pulp(60ml), white rum(30ml), sugar syrup(10ml) and ginger syrup(10ml). .. Give a refreshing spin to the mundane by adding several cubes of crushed ice.